Kids should be having fun, not flu! 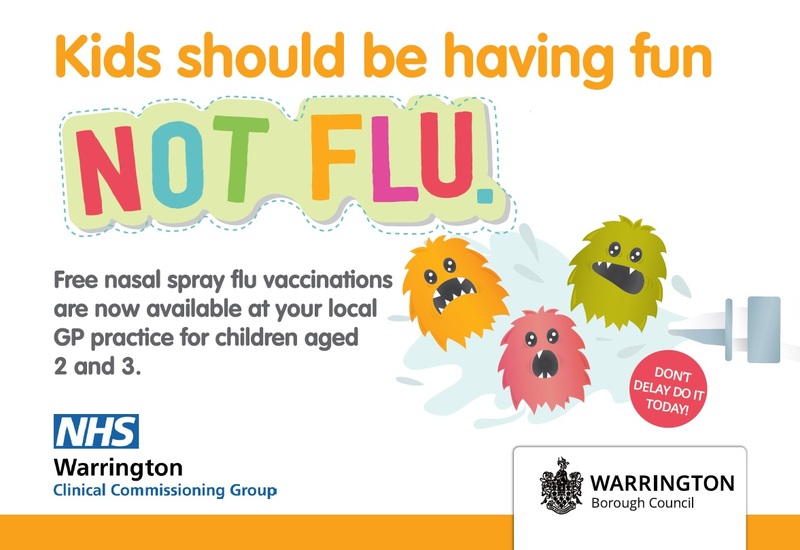 Free nasal spray flu vaccinations are now being offered to children aged two and three in Warrington. Parents are being urged to protect their children from flu this winter by taking them to their GP practice to receive the free nasal spray vaccination. Flu can be serious for young children and the vaccine helps protect children against flu and other serious illnesses such as bronchitis and pneumonia. If you have a child aged two or three you will be contacted directly by your GP practice to arrange an appointment. Children in reception class and schools years 1 to 4 will also receive the free nasal spray vaccination in school.